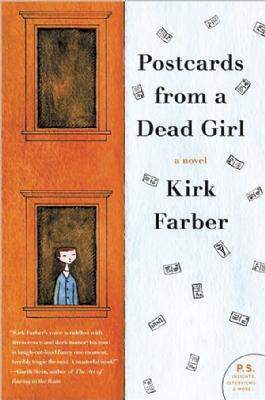 Postcards from a Dead Girl is a gripping and stunning debut novel from Kirk Farber, a newly transplanted Coloradan. story that is engaging, compelling, tragic and comic. seems to have been gone for six months, but as the story opens Sid starts receiving postcards from exotic locations. These cards are postmarked the year before. to reality. But her current emotional state is not always receptive to her brother's needs. all the workers over their headsets and frequently breaks into the conversations to give advice to secure sales. Hearing another voice in his head is not the best situation for Sid. eventually leads to a curious friendship. profound confusion and other times his crystal clarity of thought in vivid detail. very unusual and busy place. performance is failing, making his hold on interpersonal relationships and life tenable at best. boring stories and memories and - oh God no - philosophies on life." an addicting page-turner and a welcome warm read for grey, dingy days. Leslie Doran is a local freelance writer. Reach her at sierrapoco@yahoo.com. Postcards from a Dead Girl, by Kirk Farber, fiction, Harper, 256 pages. Farber will sign copies of the book at 6:30 p.m. Monday at Maria’s Bookshop, 960 Main Ave.